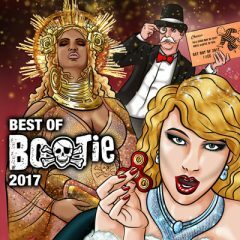 Best of Bootie 2017 — 21-track mixtape + 10 bonus tracks! Choosing which mashups to include on this year’s Best of Bootie 2017album was easy. Adrian A and Mysterious D — co-creators and resident DJs of Bootie Mashup — each chose their 10 favorite tracks to include on the album, plus 5 bonus tracks. However, the selections were such a diverse mix — showcasing the ever-widening range of the mashup genre — that assembling them into a cohesive mixtape proved challenging, to say the least. Needless to say, this year’s collection is one of our most eclectic yet, spanning a broad range of musical genres and eras. 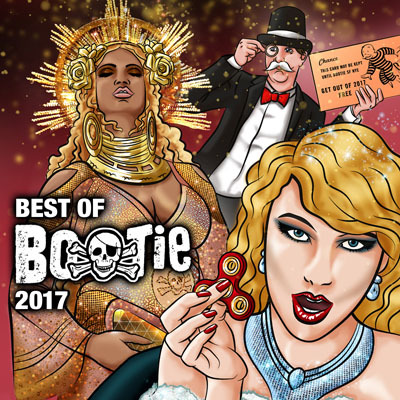 While we tried to focus on both songs and mashups that were released this past year, ultimately, this mixtape simply represents what Adrian A and Mysterious D were each spinning at various Bootie Mashup parties in 2017. There are a couple of exclusive, previously-unreleased tracks, including the debut solo production from Daedra — aka Bootie’s co-founder, Mysterious D — who opens the album with Taylor Swift being put to task by Cardi B’s mega-hit with Ready for Bodak. Bootie LA’s DJ ShyBoy offers up his brand-new Mi Gente Despacito, which showcases 2017’s Latin pop chart explosion. Ed Sheeran’s “Shape of You” wins the award for Most Mashed-Up Song of 2017 — and since Adrian A couldn’t pick just one, they put together Shape of Mashups, a mega-mashup featuring parts from five different producers. (And included another as a bonus track.) And Entyme returns to do another Bootie Intro. As usual, this 75-minute mix is meant to encapsulate a night at a Bootie mashup party — from the first get-you-on-the-dance-floor moments, to the fist-pumping bangers, to the drunken sing-alongs, to the kooky oddball tracks, to the slow jams at the end of the night. Shout-out to EN8, for mixing it all together. CLICK ON OVER TO THE ALBUM DOWNLOAD PAGE, OR SEE BELOW….